Removal of detail from a data layer to make processing or visualization easier at smaller scales. A geocentric datum is a datum, which has its origin at the Earth’s center of mass. A computerized information system for storing, manipulating and analyzing spatially indexed information. 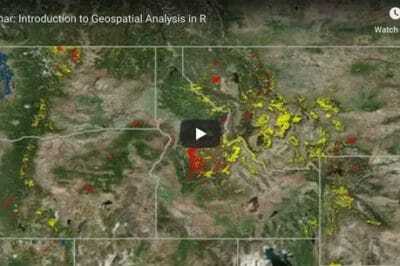 See:What is GIS? Geography is the study of the surface of the Earth. See What is Geography? A close representation, physical model, of the figure of the Earth. According to C.F. Gauss, it is the “mathematical figure of the Earth”, in fact, of her gravity field. It is that equipotential surface (surface of fixed potential value) which coincides on average with mean sea level. 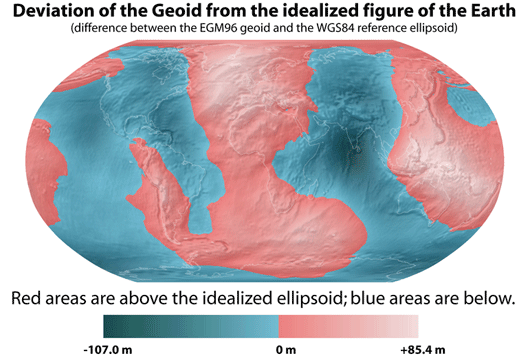 The geoid surface is more irregular that the ellipsoid of revolution often used to approximate the shape of the physical Earth, but considerably more smooth than the Earth’s physical surface. While the latter has excursions of +8000 m (Mount Everest) and -11000 m (some deep ocean trenches), the geoid varies by only approx. ±100 m about the reference ellipsoid of revolution. Because the force of gravity is everywhere perpendicular to the geoid (being an equipotential surface), sea water if left to itself would assume a surface equal to it. Similarly if sea water would be allowed to freely penetrate the continental masses, e.g., through tunnels. In reality it is not, of course; still, geodesists are able to derive the heights of continental points above this imaginary, but physically defined, surface by a technique called spirit levelling. When travelling by ship, one does not notice the undulations of the geoid; the local vertical is always perpendicular to it, and the local horizon tangential to it. Only a GPS receiver on board may show the height variations relative to the (mathematically defined) reference ellipsoid, the centre of which coincides with the Earth’s centre of mass, the centre of orbital motion of the GPS satellites. Geoportals are e-commerce sites that allow browsing, viewing and procuring spatial databases and orthophotography online. To establish the relationship between page coordinates on a planar map and real-world coordinates. Geostatistics is an application of the theory of random functions for estimating natural phenomena. It was traditionally used in geo-sciences. 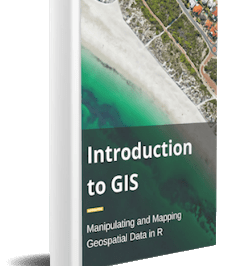 Methods of geostatistics are used in petroleum geology, hydrogeology, meteorology, oceanography, geochemistry, forestry, environmental control, landscape ecology, agriculture (esp. in precision farming) etc. The basic concept of geostatistics is that of scales of spatial variation. 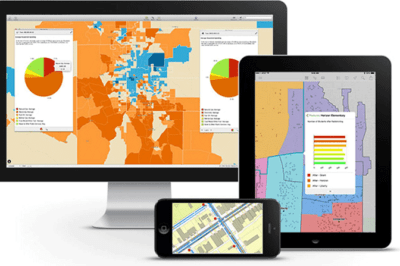 Data which is spatially independent show the same variability regardless of the location of data points. However, spatial data in most cases is not spatially independent. Data values which are close spatially show less variability than data values which are farther away from each other. The exact nature of this pattern varies from data set to data set; each set of data has its own unique function of variability and distance between data points. This variability is generally computed as a function called semivariance. Spatial autocorrelation can be analyzed using correlograms, covariance functions and variograms (=semivariograms). Method for identifying locations on earth using triangulation calculations of satellite positions. Originally created by the United States Military, it has since found numerous commercial applications. More: What is GPS? Graphical representation of the scale of a map with the numbers representing the real world units and the length of the bar the corresponding distance representation on the map. Also known as a bar scale. More: Understanding Scale. Bar scale showing graphically the ratio of map units to ground units. The top scale shows the comparable ground measurement in kilometers (km) and the bottom bar scale shows the comparable length in miles.